If you’re lucky, as I have been, your career can be shaped by mentors, role models and heroes. Many in the field of communications should be able to relate to this. A hero isn’t someone who necessarily took you under their wing. A hero isn’t someone you worked closely enough with that you chose to model his or her behavior. A hero is someone you wanted to be. Not be like. But be. That’s common in broadcasting, where professionals operate in public. Those of us who grew up wanting to be broadcasters wanted to be our heroes. I had many but, in my high school years, one stood out. His name is Chet Coppock. As a kid, I used to love to slowly dial through AM radio to hear broadcasters that, through the magic of “clear channel” signals, could come into my house from far away places. I discovered Chet on WLUP-AM 1000 in Chicago. His voice traveled across Lake Michigan, across I-94 and into my bedroom outside Detroit thanks to a 50,000 watt signal. 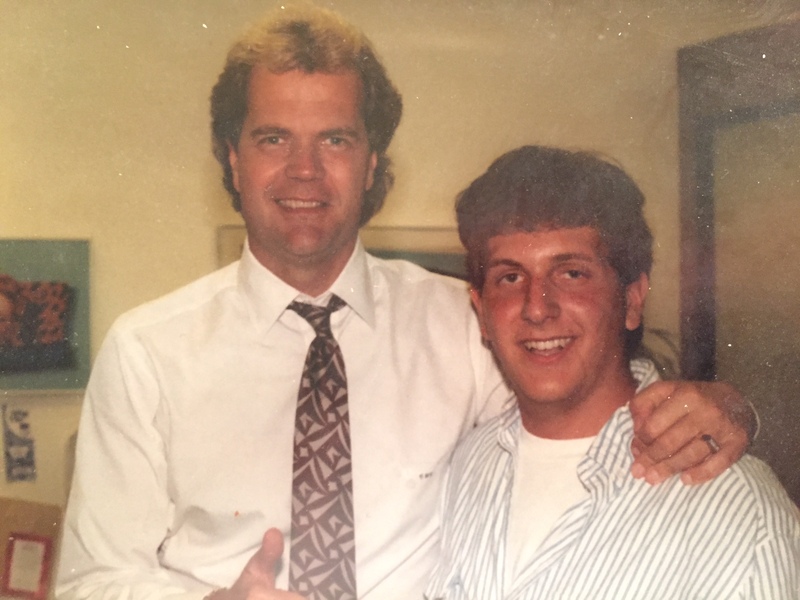 His pioneering “Coppock on Sports” show focused on interviews and every night, Chet got to talk to the biggest names in sports and did it with personality, insight and, I could tell, intense preparation. I simply wanted to be Chet Coppock. It was tough to focus on biology, pre-calc and literature when I though I could jump into the chair and behind the microphone on WLUP. Thanks to the help of the then-Assistant Manager at community WBFH-FM where I worked, a fan of Chicago radio, Ron Wittebols, I came as close as a teenage kid could to being Chet. Ron gave me a segment in his show called “Friedman On Sports” modeled after “C.O.S.” (you can listen here). I adopted some of Chet’s interviewing style on my sports talk show (you can listen here) and when I started writing fan letters to Chet and he wrote back with customized stationery that said “Absolutely…Coppock On Sports,” Ron used something called a MacIntosh computer to make me some of my own (and I realize I still use the word “absolutely” a lot). An authentic character who stood out, Chet used short sentences, standout phrasing, mixed in humor and historical references and put his guests at ease, even while asking sometimes tough questions. All of that influenced me in building skills I can still use today, but in different ways. I got to meet Chet twice in person. One time, pictured on this post, is when I convinced a friend of mine who I was visiting in Chicago to take me to the Hancock Building in Chicago, I went to the WLUP studios and boldly told the receptionist that I was there to see Chet Coppock. She called back, he popped out, put his arm around me, thanked me for stopping by and took me on a tour of the station. The other time, the following year, I interviewed him for my show in the lobby of a hotel in suburban Detroit, then he drove us to the Palace of Auburn Hills for a Pistons-Bulls playoff game. I had a ticket for the game but he tried to sneak me into the press area by telling the security guard that I was “Matt Jackson, Coach Phil Jackson’s son.” The guard didn’t buy it, Chet said goodbye and that was the last time I saw or spoke to him. When I was graduating from college four years later, I sent him a letter telling him I was looking for work. He responded “I don’t have an opening now, but if I do anytime soon, bet the ranch, I’ll call.” But he didn’t have to. I got into TV news and his career went in a different direction, talk TV in New York. I have followed him on Twitter for years and, this weekend, stumbled across this 90-minute podcast in which Chet was interviewed by a “newer school” Chicago sports talk radio host. It was like listening to “C.O.S.” all over again. My iPhone may as well have been my clock radio from my high school bedroom. He talked about his career ups and downs but what stood out to me were his reflections of those who shaped him. That got me thinking about Chet and heroes in general. He helped shape who I am, professionally. One way or another, I carry him around. It made me think how no matter how hard we try to be “ourselves,” part of us, even a small part, is emulating someone else. As business changes quickly, it’s powerful to remember the “why” and especially “who” motivated to get into this in the first place. The inspiration of decades ago can still be helpful today.